The Green Workplace: Green Coal-Fired Power Stations? Some interesting news from Europe today. 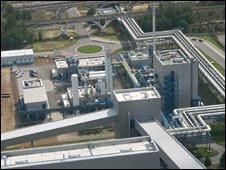 Germany has today unveiled a pilot project for the first carbon capture and storage (CCS) at a coal-fired energy plant. Next week this pilot will be formally commissioned. The mechanism is: A cloud of pure oxygen will be breathed into the boiler. The flame will be lit. Then a cloud of powdered lignite will be injected. The outcome will be heat, water vapour, impurities, nine tonnes of CO2 an hour, and a landmark in clean technology. The CO2 will then be separated, squashed to one 500th of its original volume and squeezed into a cylinder ready to be transported to a gas field. In the gas field the CO2 is forced 1,000m below the surface into porous rock.